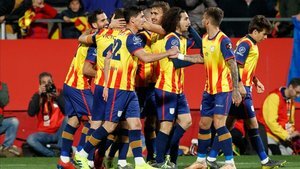 Gerard Lopez’s Catalonia beat Venezuela 2-1 at a packed Montilivi on Monday with Bojan and Javi Puado scoring on a night to remember. Gerard Pique played and Riqui Puig came on from the bench, while former Barca players Aleix Vidal and Marc Bartra were also involved. Catalonia started at a good tempo in an entertaining clash in which the woodwork was hit four times in the first half, including by Pique from a free-kick. Catalonia took the lead in the 53rd minute through Bojan. Rosales equalised for the visitors just six minutes later, but Puado bagged an 88th minute winner. Venezuela had beaten Leo Messi’s Argentina 3-1 in Madrid on Friday. Some Catalan players were missing because clubs didn’t want to release them in case they got injured in the game.